Central to the setup of the LIS is the need to set up tests to be assigned to samples. There really is no point to any LIS if there are no tests! First, it is important to be clear on just what constitutes a Test: A Test is a collection of analytes (called Parameters in the system) to be measured in some way, with some kind of results expected to be reported. So a Test may consist of one or more Parameters, each with their own normal ranges. It also consists of one or more steps, or Processes, which are collected into a Path and selected for that test. All specimens assigned that test must complete the prescribed steps in order before they can reach “Complete” status. HealthCloudPOL simplifies all of that by offering a single Path: “Analysis”. Once analysis has been done, results are entered – either manually or, if HealthCloudPOL instrument(s) interfacing has been done then automatically – and the Patient Report is generated. Or if the test should be viewed on the Drug Report, then that should have been selected during setup (see “To Create a New Test” below) and that report will display. Additional Paths are also available for selection, e.g. “Analysis with Review”. Parameters – These are the analytes, the actual things being tested, e.g. calcium etc. Tests – You might currently call these “Panels”. They are a collection of one or more Parameters. Test Groups – These are collections of tests, grouped for easy assignment to specimens. If a Test Group consists of two or more tests that all only have one parameter each (e.g. a test named “Calcium” with a single Parameter in it that is “Calcium”), then that Test Group can function as a Panel. In most cases, Test Groups are unnecessary, since a Test can contain multiple Parameters, so most people just name a Test as a Panel. Test Groups merely offer an additional level for special situations. There are over 50 tests included in HealthCloudPOL as delivered, so you may want to filter for the test you are looking for. Just click the Filter button or the Advanced Filter icon and enter your search criteria. The list of tests that meet your criteria is returned. Click the Test Name to view the test’s details. For any test that is Active, the fields are grayed out and un-editable. The Parameters of the test may be viewed by clicking the Parameters button. Click any Parameter to see its details. Note: Limits may be edited here by clicking the New Limit Revision button. For guidance on how to do that, see To Create a New Test below. Navigate to the Test Management menu item. Click the New button (this can also be done from within any test’s detail screen). Work through all the mandatory fields (in bold) and any of the others that you choose. Test Name – This must be unique. If a test exists with the same name, it will be de-activated upon activation of the new test with the same name. 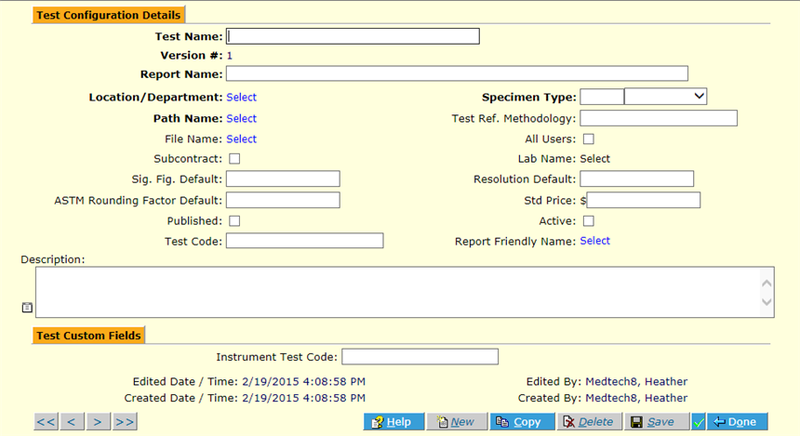 Specimen Type – This field is how the list of appropriate tests is determined when adding tests to a specimen. For example, if a Specimen Type of “Plasma” is selected here, then this test would be displayed as available for any specimens for which the “Plasma” Specimen Type has been chosen in the Sample (Specimen) detail screen. File Name – An SOP or Method file can be associated with the test if it has been uploaded to HCPOL in Document Recording Management and given the type “SOP”. All Users – This should normally be checked to allow all users to access this test. It can be limited later if desired, as a new test version. Subcontract – If the test is always subcontracted, check that box and select the lab (must be defined in Patient Management). The Test Name should reflect this. Sig. Fig./Resolution Default – If test has a lot of parameters, specify a default significant figures (number of total number places a value displays on the report) and resolution (number of places displayed to the right of the decimal on the report), then any parameters as added will default to that (makes it quicker) – although they can be edited individually. Report Friendly Name – It is important to select the report where this test is to appear. The default report is “Patient Report(PG)”. If it is a drug confirmation test, then select “Drug Report”. NOTE: Always note there may be more than one page to select from. The number of pages is displayed at the bottom right of the popup. Click to go to page 2, 3, etc. if the report you need isn’t in the displayed list. Upon saving, the test detail screen displays additional buttons for adding Parameters, QC Tests and, if All Users wasn’t selected, Test Users. No test is functional until items to be measured are added to it. These are the Parameters, and they are what will display in Data Entry for results to be entered (either manually or, if HealthCloudPOL integrations have been implemented, then automatically). 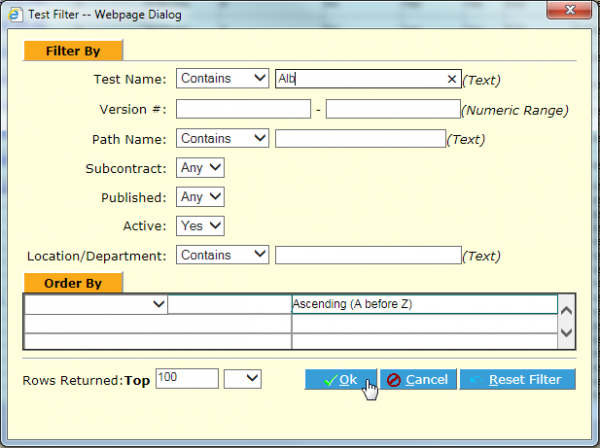 Once the test has been initially saved as in To Create a New Test above, the Parameters button displays at the bottom of the page, which allows the adding and setup of parameters and any associated limits, formula, etc. Click the “Select” link next to Parameter Name to browse for the parameter you would like to add to the test. You can use the popup’s filter to narrow your search. Note: If the parameter you need is not in the list, go to the Test Parameter Management menu item and add the new parameter there. It will then show as available for selection here. Significant Fig/Resolution – Add the number of digits to be displayed in total for any result for this parameter, and the number of decimal places to extend. 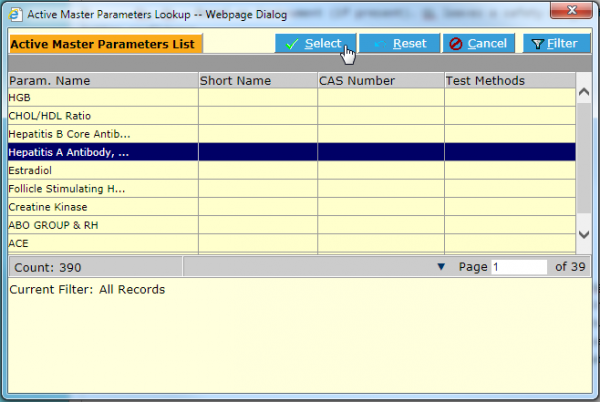 Unit Name – Assign units for the result values for this parameter. You can add/edit units in Picklist Management. All Data Entry units are “Analysis” type units. NOTE: It’s usually best to make sure the necessary units exist before setting up tests. 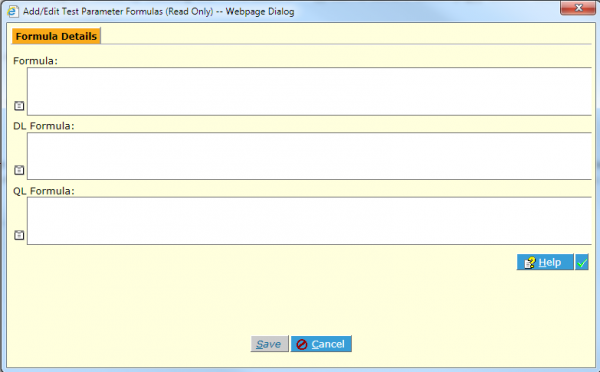 Parameter Description – This will be used on report if present, otherwise it defaults to Name. All Processes – Choose whether the Parameter is to display in all processes. If not, leave unchecked and you will be able to specify which process(es) in the next step. 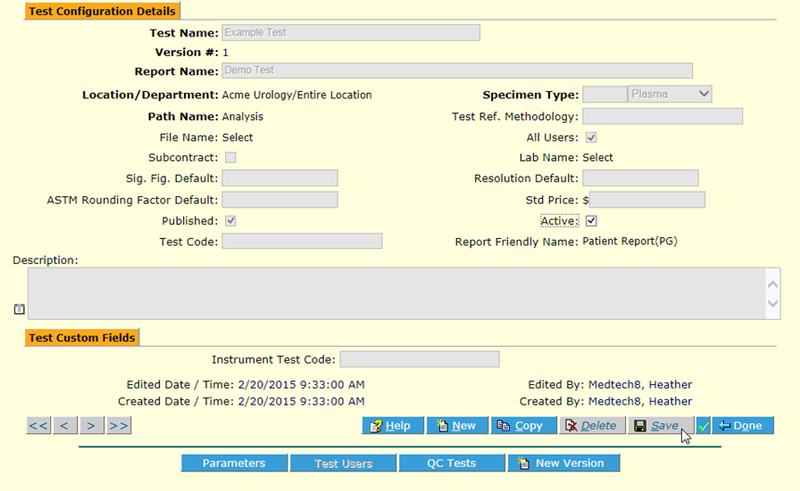 Required – Choose whether this Parameter must have a result entered before a specimen can go to “Complete” status. Selectable Results – Check this box if you prefer results may not be free text, but rather selected from a specified drop-down picklist (if so, you can specify choices in the next steps below). Allow Multiple Results – If Selectable Results is checked, you can allow more than one value to be selected from the results picklist here. Once these choices have been made, click Save . Additional buttons display, allowing you to define any Formula and/or Limits or Ranges for the parameter in this test. Also, if the All Processes box was not checked, then the Processes button is active so you can define in which Processes this Parameter displays, and if Selectable Results checkbox was selected, then the Selectable Results button will display, so that possible result choices may be set to display for the user during manual data entry. 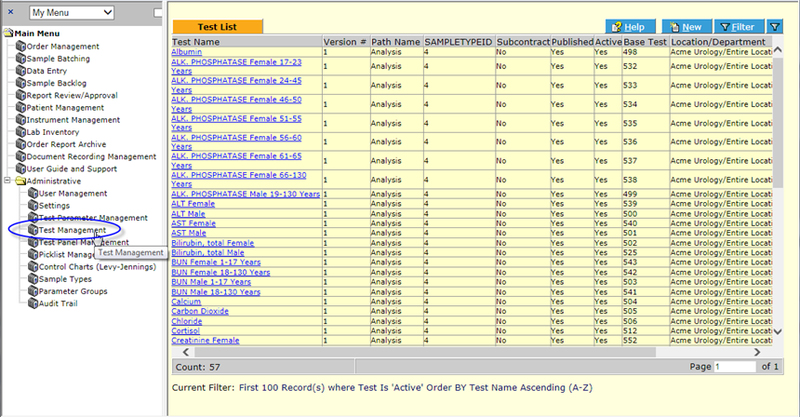 In the Test Parameter Details screen once initial Parameter details have been saved, click the Formula button. You can either use free text or the provided controls to build your formula for this parameter result calculated value. Results from other Parameters may be used in the formula. You can use the Validate button to test that the formula construct is valid, and you can also use the Spell Check to proof for spelling errors, as with all pages. Where the ~p~SELF~p~ [Current Parameter] is the parameter we are adding to the test, in this case aluminum. “*” is the multiplication operator. And ~p~13.-285~p~[200.7 Liquid Metals ICPOES v.1 – Dilution Factor] is the Test Parameter we chose after clicking the Other Params button. In the expression ~p~13.-285~, 13 is the TestID and -285 is the Master ParameterID. It is not necessary to know the IDs required for a Test or Master Parameter; however, it can be helpful in troubleshooting calculation-related issues. Click Save to save the formula for this Parameter, and return to the Test Parameter Detail screen. HealthCloudPOL will flag any results that fall outside value ranges that you define for any parameter. You can define ranges (Limits), as well as any internal warning limits or specifications, using the Limits function in the Test Parameter Details screen. In the Test Parameter Details screen once initial Parameter details have been saved, click the Limits button. The Limit Set frame displays. Select a Limit Type, Operator and Limit Value. The argument is “Flag the result if it is [Operator – e.g. Greater than, less than, etc.] [Limit Value]”. The Limit Type list is modifiable (see Picklist management). You may have as many types of limits and limit sets as you like. NOTE: Modifying (copy/change) parameters not recommended, especially if any are currently under testing. It is better to create a new test revision. That way any specimens with that test assigned will complete as normal, and any new accessions will be given the new version. Important NOTE: In order for the Range to appear on the Patient Report, it must be entered in the ‘Note’ column, on any existing Limit row (not on more than one). If the All Processes box has not been checked and there is more than one process or step so that you would like to specify for which one the parameter is available, click the Processes button to display the Parameter Processes selection frame. Select each process, one-by-one, Saving each as you go. If you require a process or step to be completed (i.e., a result or observation, etc. of some kind entered for that parameter for that process), then check the “R” checkbox. If you have checked the Selectable Results checkbox for the Parameter, then you can define the drop-down picklist choices by clicking the Selectable Results button. The Selectable Results frame displays. Type in the results choices you would like the analyst to choose from when entering results manually for this Parameter. If you would like one to be the Default value, check the “D” checkbox. 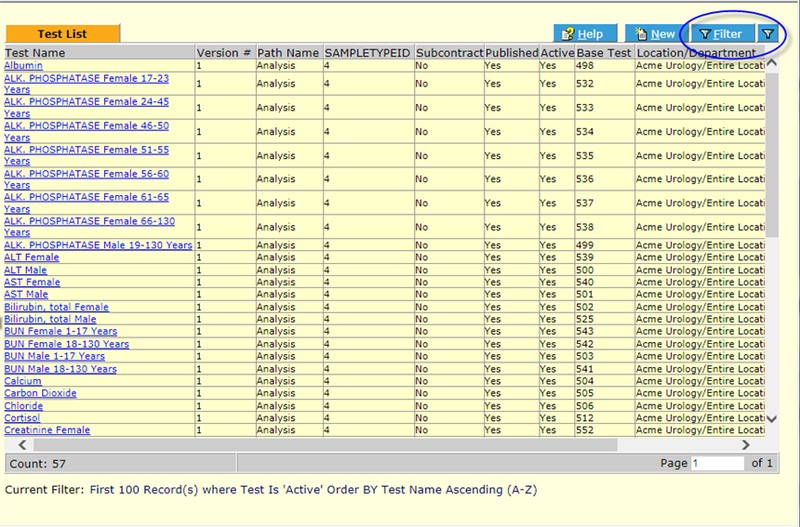 Once all set up, click on Save and Done to return to the Test Configuration Details screen. If All Users box was not checked, and you would like to specify only certain users as authorized for this Test, in the Test Configuration Details screen click the Test Users button. Here you can assign specific users to the test. There is no need to Save, assignments are complete once made. Check “Published” and “Active” and then click Save to finish and activate the Test. No changes may be made. If changes are required, make a Copy. The Name will not be editable, and the copy will be a new Version. The old test will be made inactive automatically if the new one is made active. A QC Test can be created manually just like a regular Test in the system, but with frequencies defined, and then generated automatically. 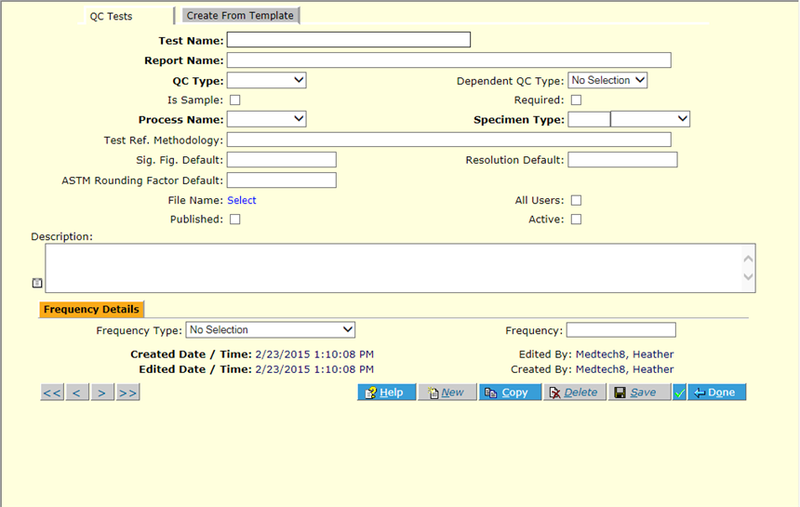 From the Test Configuration Details screen, click the QC Test button. The system displays the Quality Control Test List area. 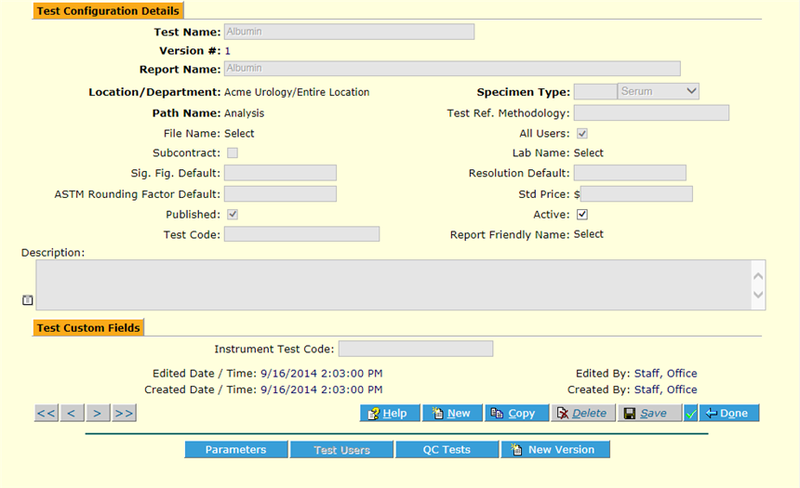 Select a Test Name to edit an existing QC Test, or click New to create a new one. The QC Tests Add-Edit screen is displayed. Complete the fields of the QC Tests tab. Bold fields are required. Test Name – The Test Name is the name of the test that will show up to the users of the system. This is normally a short name or nickname that all of the users will recognize. Report Name – The Report Name is the formal name of the Test as it should be displayed on reports. QC Type – The QC Type indicates the main grouping information for the QC Template for control charting. Select this type from the Quality Control Type picklist. Dependent QC Type – The Dependent QC Type defines for the system another QC Test that this QC Test needs to have in the batch. Select the Dependent QC Type from the drop-down list. Is Sample – This flag defines whether the QC will be a QC Sample, which is a new sample introduced to a Process Group/Batch (CCV, Blank, ICV, etc) or a QC Test assigned to an existing sample (Matrix Spike, Matrix Spike Duplicate, Lab Replicate, etc). Check this flag if this template will be creating a specimen in the system. QC Sample Required – Select the checkbox if this QC Test is required for the regular test you created in order for the specimens to move to “Complete” status. Process Name – The system will display the Processes in the Path assigned to the current regular Test. Select the Process Name from the drop-down list to define which process this QC Test will show up to add to the Process Group/Batch. Specimen Type – The Specimen Type is the Matrix of the sample on which this test will be performed. It will only display as available to the user for the selected type. Select the type from the drop-down list. Sig. Fig. Default – The Sig Fig Default field at the Test level designates that all parameters assigned to this test will have the same Significant Figures. Type the number of significant figures that will be applied to the results for test parameters during rounding. Resolution Default – The Resolution Default field at the Test level designates that all parameters assigned to this test will have the system begin the rounding at the same number of decimal places to the right of the decimal point. Type the number of places to the right of the decimal point to start rounding. File Name – The File Name field allows us to associate an SOP or Method Document that has been uploaded into the system in the Document Management module. Click the link to select the File Name from the SOP Document Lookup List. All Users – The All Users flag tells the system to allow anyone user of the system to perform the operations necessary to complete the Test for the samples it is assigned to. Select the checkbox to allow all system users to view and enter data for this Test. Published – Select the checkbox to publish the Test. Do Not Publish the Test until all parameters and associated information have been entered. Active – Select the checkbox to activate the Test. Do Not Activate the Test until all parameters and associated information have been entered. Description – Type a description. Complete the fields of the Frequency Details area. This area defines how many and how often this QC Sample is added to the Process Group/Batch. The following choices are available for the frequency type. The “?” is filled in from what is entered in the Frequency field. “[” Front Bracketed means at the Beginning of the batch, “” bracketed means Front/Middle/End of the batch and “]” Rear Bracketed means at the end of the batch. Frequency Type – Select the Frequency Type from the drop-down list. Frequency – Type the frequency for the Test. When you are finished, click Save . The system displays the Parameters button. 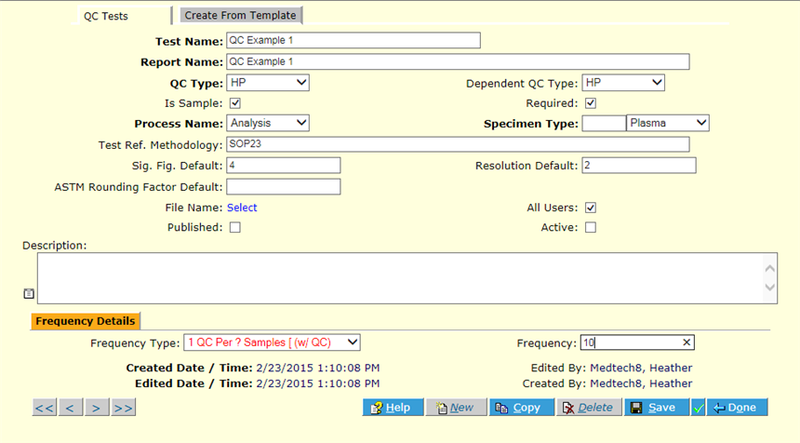 Click to display the QC Test Parameters frame. 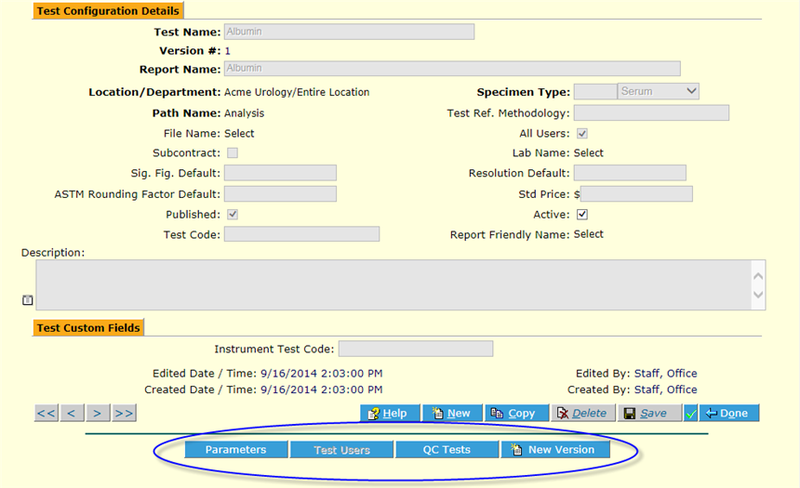 Click the New button to create a new QC Parameter and proceed as in any test as described in Add parameters to Test above. 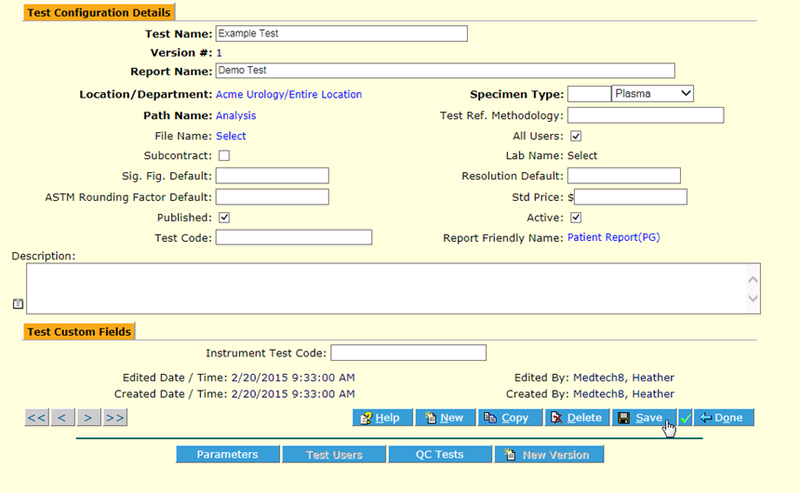 When all QC Parameters have been entered and set up completely, click Done repeatedly until you return to the master Test Configuration Details screen and check Published and Active checkboxes to activate the new test, complete with all Parameters, Ranges, QC Tests and other elements as available for assignment to appropriate specimens. Previously editable fields will now become grayed out and uneditable. A new revision must be done to update the test if you need to keep the same name.